We all live busy lives and sometimes it can be difficult to find time to take a step back to reflect on the life we are living. With this short article I would like to introduce myself and share my reflections on the subject of my expertise Quality of Life and Work-Life Balance. I´m a Quality of Life Consultant. I deal with quality of life issues every day; both personally (at home; family and personal time) and professionally (at work, coaching clients and running workshops). I´m the creator of Webbs Quality of Life Model© which I´m on a mission to take global. I hope you will find this short article inspiring! Work-life balance – Why? I haven´t got time! You might say to yourself, “Work-life balance doesn´t exist in my life, I haven´t got time to even think about it, never mind do something about it”. For many of us it might feel like an unrealistic task to even get time to reflect on this subject. Believe me, you will become more positive just by giving yourself 5 min to read through and reflect on the content below. 10 years ago when I managed an IT- and telecom company in Sweden, I was in the `treadmill´ and I didn´t even know that I was suffering from severe stress. I never gave myself time to take a step back and reflect on my actions. My self neglect resulted in a burn-out. I would never have considered reading this. I would have said to myself: “I´m fine, I don´t need that”. Please keep reading, don´t make the same mistake that I did – refusing to listen to my body or anyone else who might have been worried about my well-being. If you recognise yourself in what I´m writing, believe me, you can take control of it now! All that is needed from you is one step in the right direction. Start to question your actions. No-one is perfect. Life will continue to have its ups and downs which we all need to be prepared for. Allowing yourself to lower the bar on some of your tasks will help you to find a comfortable balance in your life. I argue that we all need to learn to be adequately `lagom´ satisfied, with what we achieve in our lives. Lagom (pronounced [ˈlɑ̀ːɡɔm]) is a Swedish word with no direct English equivalent, meaning “just the right amount”). Webbs Quality of Life Model©, which I created in 2009, has been a great help for me when reflecting on what is important in life. The model was created as a result of losing our first born child in 2006. At the time I reflected on “Why do we live?” “What is quality of life?”. If it wasn´t for Lilly, the model would never have been created, I´m proud to say that I´m now on a mission to take the model global. I would like to inspire you with an example from Webbs Holistic Coaching Wheel™. 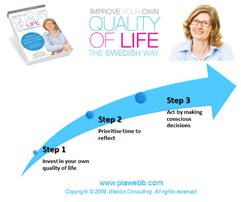 It is the main empowering coaching tool from Webbs Quality of Life Model©. The tool helps you to quickly identify areas in your life that you need to work on. Below you can get inspired by a Managing Director´s current situation and what first step he took towards improving his quality of life. I do not spend enough quality time with my family. First step – I shall start to have a computer-free evening once a week. I´m not being honest with my wife, about how I feel. First step – Arrange a time to talk to my her and tell her how I feel. Unable to focus on my duties, due to constantly being interrupted. First step – I shall inform colleagues about my situation and suggest a solution to how I can have undisturbed time each week. I tend not to take any breaks from my desk and often don´t give myself time to eat lunch. First step – I will start to bring lunch to work and go and sit somewhere away from my desk to eat. I hate going to work. First step – I will write down a list of alternative ways of going forward. First step – Are you motivated? Do you want to improve your current work-life balance? If so, take a moment to reflect on what you have just read and identify some first steps you can take, both in your personal life and in your professional life. How does your current situation look? What would be a first step to improve it? What steps are you motivated to act upon? Finally, remember, if you look after yourself and make sure you take steps towards feeling better about yourself, you will indirectly have a positive effect on the people around you. Hope this short article has inspired you to start to improve your own quality of life. If you liked above, you will love my book. Why delay, buy it today! You can read more about Webbs Consulting services here! Get inspired by others Top 10 Quality of Life List here! Nothing has ever been served to me on a plate. I have had to work very hard to understand and deal with all the issues that have been put in my way. I don´t believe in treating the symptoms, instead I always want to find the root of the issue and deal with it. I must admit that my life hasn´t been an easy ride, however, in the end I´ve managed to achieve a sustainable change for the better.